 The Fifth Grade program at Dade Christian School challenges students to reach their full potential as they develop their skills in the intellectual, spiritual, physical, and social realms in a fun and loving educational environment. Our curriculum is a thoroughly integrated, academically balanced program with a consistent Christian emphasis. Bible, Language Arts, Phonics, Reading, Math, Science, History, Spelling, and Penmanship all represent the subject areas. An emphasis is also placed on social interaction among the students, giving them opportunities to develop social values; respect, sharing, group acceptance, independence, and dependability. The purpose of the reading curriculum is to expose students to different genres of literature as well as strengthen their reading comprehension level. These areas will be addressed through the use of reading, listening, and speaking. Activity book reports are part of the reading curriculum. This curriculum will also strengthen the students’ spelling skills and foster a broader vocabulary. The students will be evaluated on their knowledge of the literature being read, as well as their spelling and vocabulary skills. The students will also explore several novels written by varied authors. The purpose of the fifth grade Bible curriculum is to educate students to implement in their lives the lessons learned through the study of Old Testament characters. Students will be challenged to make proper choices and to share the Truth in word and deed both in and beyond school.